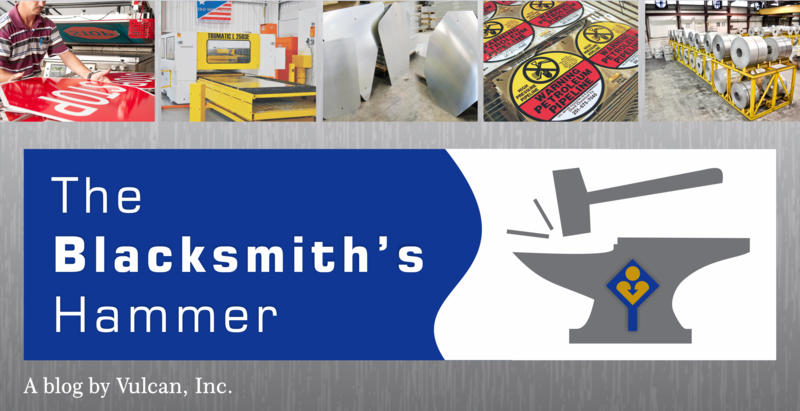 Bending, blanking, drawing, forming… the world of metal stamping involves an array of very specific processes and procedures. Believe it or not, metal stamping is an essential service in which many of the product components in your home or office are fabricated. The chair you are sitting in most likely has a stamped part, as well as the car you drive and the tools in your garage. From energy, to environmental, computer, automotive, hardware, electronic, government, office furniture, lawn and garden, home furnishings and highway construction, metal stamping plays a vital role in many industries. To better understand the different processes under the metal stamping umbrella, Part 1 of this blog post will provide information on Bending, Blanking, Coining, Drawing and Embossing. Bending- Bending is a common metalworking technique used to process sheet metal. Vulcan Metal Stampings does this process by hand or by using a V-die on a brake press. 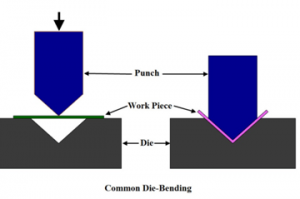 Usually, bending has to overcome both tensile stresses and compressive stresses. When bending is done, the residual stresses make the material spring back towards its original position, so we have to over-bend the sheet metal keeping in mind the residual stresses. When sheet metal is bent, it stretches in length. The bend deduction is the amount the sheet metal will stretch when bent as measured from the outside. Also, a bend has a bend radius, referring to the inside radius. The bend radius depends upon the dies used, the metal properties, and the metal thickness. Blanking- Blanking is a shearing process where a punch and die are used to create a “blank” from sheet metal or strip. The process and machinery are usually the same as that used in piercing, except that the piece being punched out in the piercing process is scrap. In blanking, this piece being punched out is the actual part. Vulcan Metal Stampings also does fine blanking: a specialized form of blanking where there is no fracture zone when shearing. This condition is achieved by compressing the whole part and then utilizing an upper and lower punch to extract the blank. This technique allows the process to hold very tight tolerances, and perhaps eliminate secondary operations. Let Vulcan Metal Stampings help with your blanking needs when using metals including aluminum, brass, copper, and carbon, alloy, and stainless steels. Coining- Coining is a form of precision stamping in which a work-piece is subjected to a sufficiently high stress to induce flow on the surface of the material. The term originated from the process of manufacturing coins. Coining is a cold working process that uses a great deal of force to deform a work-piece, so that it conforms to a die. Coining can be done using a gear driven press, a mechanical press, or more commonly, a hydraulically actuated press. Coining typically requires higher tonnage presses than stamping, because the work-piece is deformed and not actually cut. Drawing- Drawing is a metalworking process which uses tensile forces to stretch metal. It is broken up into two types: sheet metal drawing and wire, bar, and tube drawing. Vulcan Metal Stampings does sheet metal drawing, which is defined as drawing that involves plastic deformation over a curved axis. The success of drawing is related to two things: the flow and the stretch of material. As a die forms a shape from a flat sheet of metal, the material must conform to the shape of the die. The flow of material is controlled through pressure applied to the blank and lubrication applied to the die or the blank. If the blank moves too freely, wrinkles will occur in the part. To correct this, more pressure or less lubrication is applied to the blank to limit the flow of material and cause the material to stretch or thin. If too much pressure is applied, the part will become too thin and break. Drawing metal is the science of finding the correct balance between wrinkling and breaking to achieve a successful part. Embossing- Embossing is a process for producing raised or sunken designs or relief in sheet metal. This process can be made by means of matched male and female dies, or by passing sheet or a strip of metal between rolls of the desired pattern. The sheet metal embossing operation is commonly accomplished with a combination of heat and pressure on the sheet metal, depending on what type of embossing is required. Metal sheet is drawn through the male and female roller dies producing a pattern or design on the metal sheet. 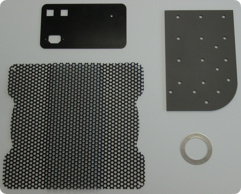 Depending on the roller dies used, different patterns can be produced on the metal sheet. This combination of pressure and heat actually “irons” while raising the level of the image higher than the substrate to make it smooth. The term “impressing” enables one to distinguish an image lowered into the surface of a material, in distinction to an image raised out of the surface of a material. Vulcan Metal Stampings commonly uses embossing as a means to strengthen or stiffen a part. Stay tuned… Part 2 of Metal Stamping 101 will cover Forming, Laser Cutting, Piercing and Progressive Stamping. 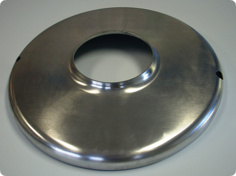 For more information or to request a quote, please visit www.vulcanmetalstampings.com or call 1.888.846.2805. 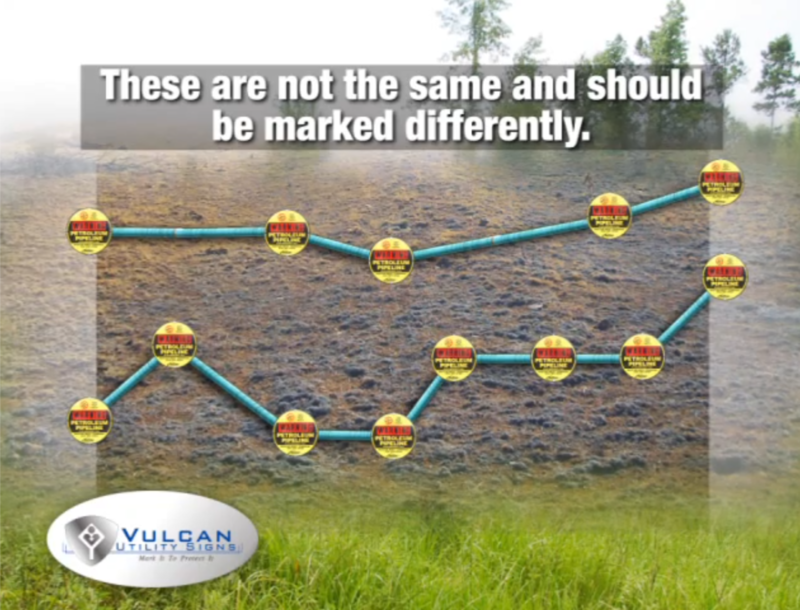 Underground pipelines… they span all across the country transporting essential commodities such as oil, gas and water, however they often go unnoticed since their presence is hidden below the soil. Excavation and even minor digging can potentially cause serious issues due to the fact that you never know where an underground pipeline may exist. 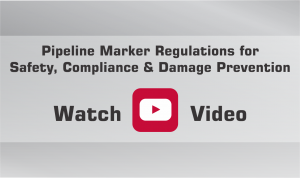 Industry regulations such as CFR Title 49 | 192.707, CFR Title 49 | 195.410 and API RP 1109 are in place to provide specifications on the design and location of pipeline markers. These regulations are fairly clear for most marking situations, however gray areas still exist, which is where the Best Practice Line of Sight steps in to fill in the gaps. The Line of Sight concept refers to being able to stand at one marker and see the next marker down the way. If the next marker in the line is hidden, there is no easy way to determine the path of the pipe below. Far from rocket science, Line of Sight is a simple yet effective Best Practice in the pipeline industry. 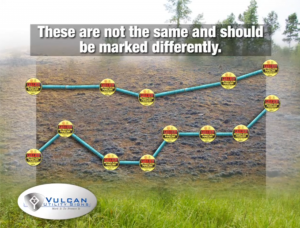 For more information on Line of Sight, CFR and API regulations associated with pipeline marking, please visit Vulcan’s YouTube Channel to watch an educational video. To place an order for pipeline markers conforming to the regulations discussed in the blog article, please call 1.800.426.1314 or visit www.vulcanutilitysigns.com. Safety signs, OSHA signs… whatever you choose to call them, they all serve the same purpose; to communicate a precautionary message where a potential workplace hazard exists. Over the years safety signs have changed very little, until now that is. Recently, the American National Standard Institute (ANSI) developed the ANSI Z535.2-2011 format for environmental and facility safety signs. This new standard was created to enhance the communication of workplace hazard messages. 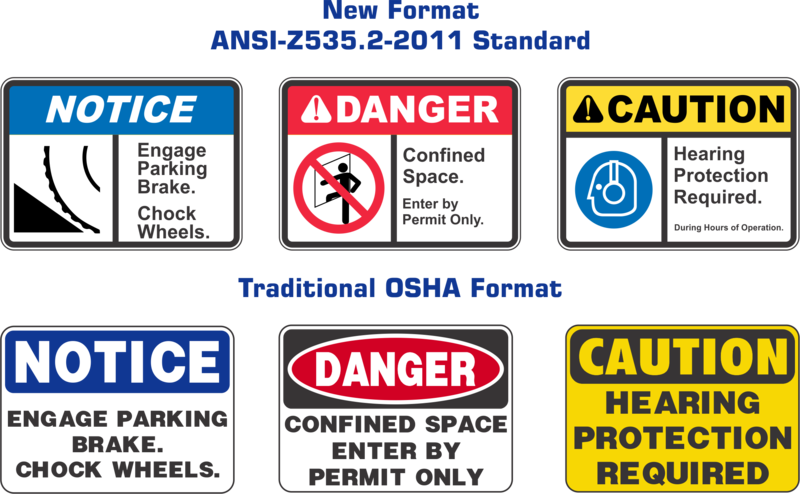 For a clear illustration of the layout enhancements made, see the comparison below of traditional OSHA signs versus the new ANSI Z535.2-2011 format. As you can see, there have been quite a few changes made to the new ANSI format including a new text style and pictograms (symbols) that illustrate the potential hazard. 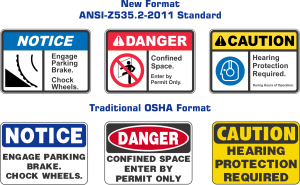 Safety signs using the traditional OSHA format will still be acceptable for use in spite of the new ANSI Z535.2-2011 format. The key components of the new standard are described below. 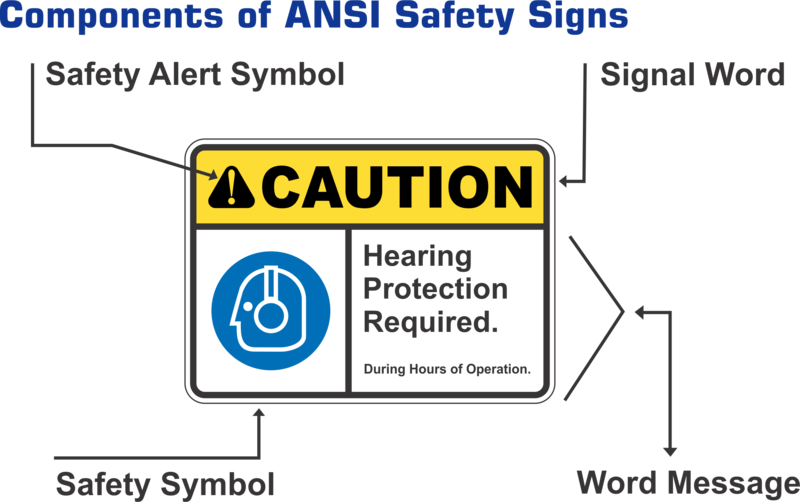 When designed correctly, the new ANSI safety signs can be highly effective. There are several steps that need to be followed in order to ensure compliance with the standard. Below is a beginner’s outline of those steps. Identify the potential hazard for which the message needs to be communicated. Determine the best location for the sign. Determine the distance that the sign needs to be visible from. Once distance is determined, the size sign may be figured. Determine whether a horizontal or vertical layout would fit the location best. Determine the Signal Word needed. Determine the Safety Symbol needed. For more information on ANSI Standard Z535.2-2011, please visit http://www.nema.org/Standards/z535/Pages/default.aspx. 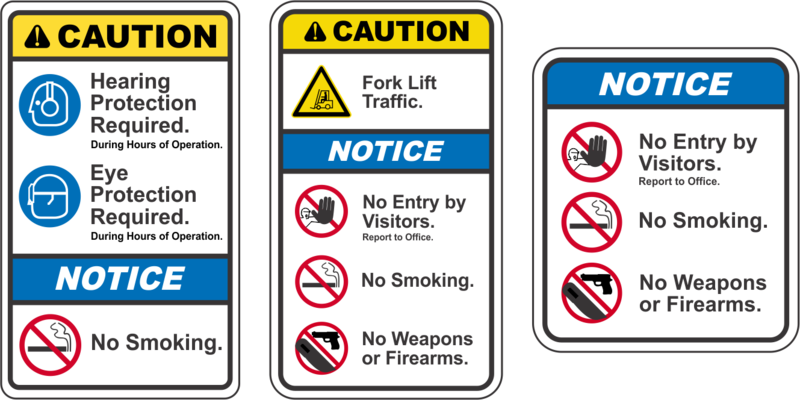 To upgrade the safety signs in your facility according to the new ANSI Standard, call or email Vulcan, Inc. today! 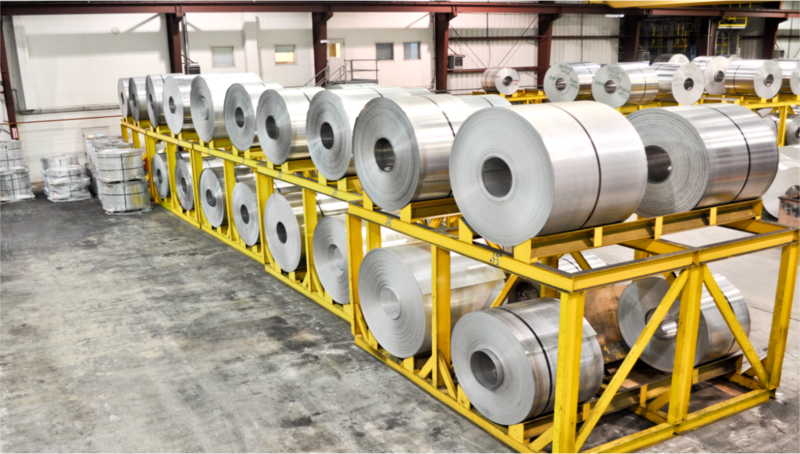 In 1986, construction was completed for Vulcan’s state-of-the-art aluminum rolling mill. 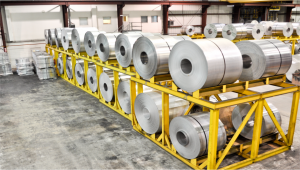 Always known as fabricators of quality signs for the transportation industry, Vulcan was about to embark on an entirely new business venture… the manufacturing of 5052 aluminum coil and sheet. 5052 was chosen as the alloy to manufacture for one simple reason; it was and still is the alloy specified by all state Departments of Transportation (DOTs) for road signs. With two sister divisions, Vulcan Aluminum and Vulcan Signs, utilizing 5052 aluminum blanks in their fabrication process, the goal was to become vertically integrated. This would allow for greater control in the areas of quality and lead time. 5052 alloy also has higher magnesium content than most other alloys, giving it more strength and greater corrosion resistance. Sheeting 101: Engineer Grade, Diamond Grade, High Intensity Prismatic… Clarification for the Confused. Since the advent of reflective sheeting in the 1930s (by 3M Corporation), scientific research has advanced this product component primarily used for highway signs, steadily improving brightness and visibility over time. 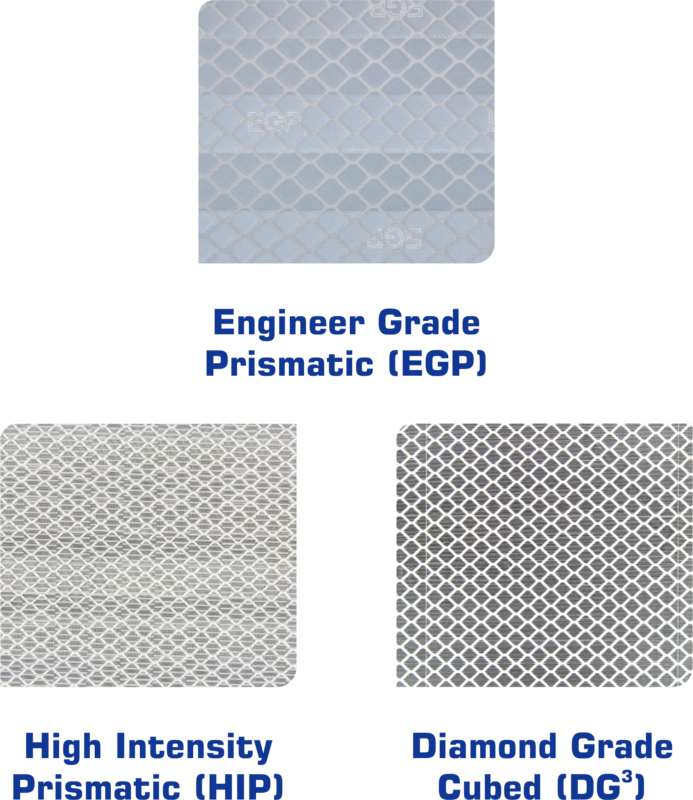 First, Engineer Grade sheeting was introduced into the marketplace, followed by High Intensity and Diamond Grade. 3M has developed all grades of sheeting with prismatic technology, providing brighter, longer-lasting signs for the motoring public. When determining which sheeting type to utilize in highway sign fabrication, several concerns come to mind. Will the sheeting meet the specs required for that particular type sign? What about longevity in the field? – Engineer Grade Prismatic (EGP) has no warranty, and has a life expectancy of five to seven years. – High Intensity Prismatic (HIP) comes with a 10 year warranty. 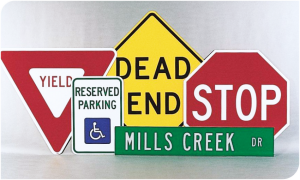 HIP Type 4 meets all mandated FHWA retroreflectivity standards in all colors for ground mount signs. 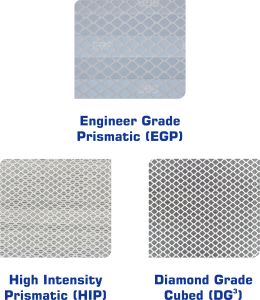 – Diamond Grade Cubed (DG3) provides superior performance and has a 12 year warranty. 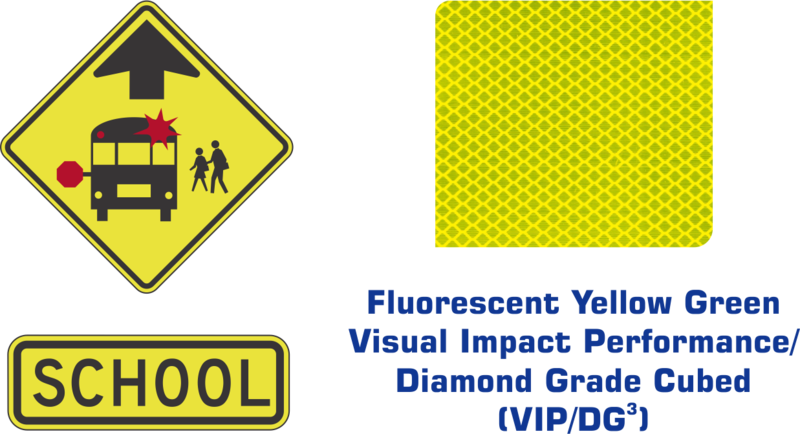 – School signs and unsignalized pedestrian crosswalks shall be Fluorescent Yellow Green (FYG). Retroreflectivity simply refers to the property of a traffic sign to reflect light back to the driver to increase nighttime visibility. 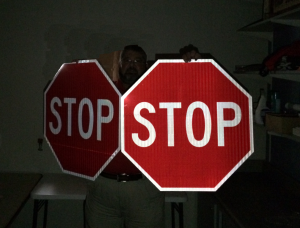 Retroreflectiviity degrades over time, necessitating the need for systematic replacement of signs to maintain the retroreflectivity standards established and required by FHWA. Angularity refers primarily to Entrance Angle, which is the angle of the sign relative to the vehicle when the sign is viewed by the driver. 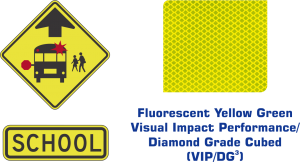 The angle at which a sign is seen affects its visibility, especially at night. The more angled a reflective sign is from the driver’s perspective, the lower the amount of retroreflected light reaching the driver and the less bright the sign appears. The Entrance Angle varies according to the driver’s distance from the sign, so the reflective sheeting must be able to perform well along the whole approach to the sign. 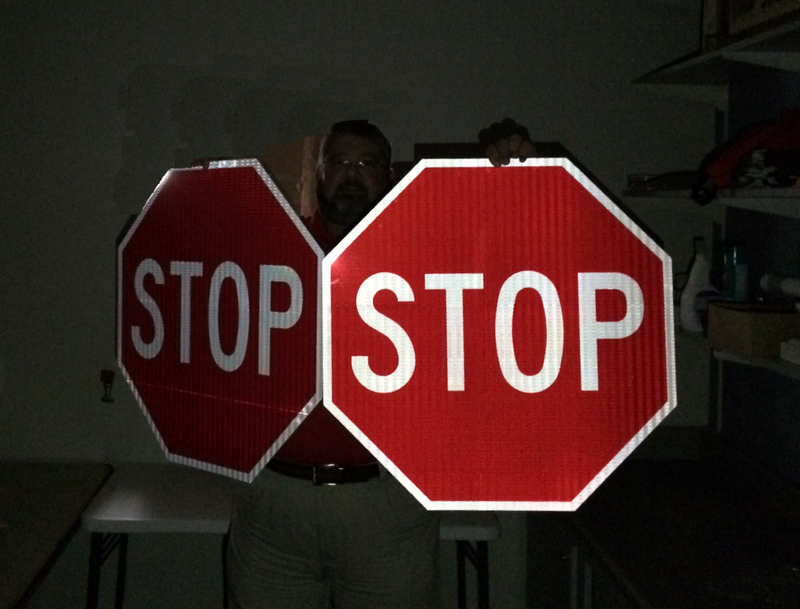 As seen in this photo, angularity greatly affects the visibility of a sign under nighttime conditions.